A few weeks ago, we two brave LEARNers ventured into the wilds of Barrhaven (an Ottawa suburb fondly referred to as “Barbeque Haven”), during a rainstorm, in rush hour traffic, to participate in a leadership initiative of the Ottawa-Carleton District School Board. The event featured some awesome student projects and delicious student-created fare, but the real drawing card was a keynote address from none other than Sir Ken Robinson. Now, for those of you who are not familiar with Sir Ken, he is an author, professor and international education advisor. He was knighted in 2003 for his work in the arts, as well as his involvement in education, creativity and innovation projects. His 2006 TEDTalk is the most watched (at the time of this posting it had 7,301,201 views! ), if not one of the most popular, and his books are best sellers. Yes, you might say that we admire him…just a little. This particular evening, he was addressing a room full of students, parents, teachers, administrators and visitors with a keen interest in improving student success through the implementation of innovative practice. The theme for the evening: how the power of creativity is a paradigm shifter in our modern schools and that finding your personal passion can be life changing. There’s a revolution going on! An economic and cultural transformation is taking place at a global level due in large part to innovations in technology and rapid population growth. The way we work and live is changing. This evolution must be reflected in the field of education. To illustrate the change, Sir Ken referred to his book (one he plugged frequently) Out of Our Minds: Learning to be Creative, which he edited for a 10th anniversary re-release in 2011. He thought he would make some minor changes to the original version in a single weekend, but the actual overhaul took months. The scope of the project was a direct result of the the vast number of changes required due to advancements in technology. For example, the prevalence and impact of social media…which did not exist in 2001. (You can now follow Sir Ken on Twitter @SirKenRobinson). In order to respond to change, we need to tap into that which separates us from other life forms: imagination. Unlike dogs (his example not ours), humans have powerful imaginations from which creativity springs, and this ability to fashion novelty is greatly sought after. According to a recent IBM study of 300 company CEO’s, the three most desirable employee characteristics are the ability to respond to complexity, to be adaptable to change and to be creative. So why are we not preparing our kids to stay ahead of the curve? The more complex the world becomes the more creatively we need to respond to problems. Sir Ken contends that creativity is not a separate activity from the intellect, and yet so many adults believe that they are not creative. The most common myths include that only special people are creative, that creativity is tied directly to things like the arts, and that there’s nothing we can do about it. Not only can creativity and creative thinking be taught, but it SHOULD be taught, systematically, and across curricula. Finding the intersection between what we’re good at and what we love is key. When we follow our talents and passions we meet different people and create a life for ourselves. A path unfolds which is neither linear nor predetermined, and rarely the one we put on paper with our guidance counselors way back when. Many people spend their lives “enduring” with no real feeling of fulfillment. Most people have no idea what they’re really capable of. Sir Ken’s conviction is that we are all born with deep talents and abilities: “It comes with the kit.” And, to be “in the element” infers that we are doing something for which we have a natural capacity or aptitude…with passion. We have all had the experience of doing something routine or uninteresting and have the seconds drag on. When we are in our element, the hours fly by. After 90 minutes of inspired and hope-filled dialogue, we left the event on a high. Sir Ken did not disappoint! He is an incredibly witty and skilled orator with a worldview that enables him to make connections between seemingly remote ideas. Admittedly, we now have more questions than answers in terms of how to implement the changes he is advocating. The big question posed by the OCDSB that evening was the following: What are the conditions under which healthy and creative individuals and organizations flourish? Consider the question for yourself and your students. How can you create an environment at your school where students (and staff) can be creative and find their passion? Where’s the jealous button? Did his talk have anything new compared to that Tedtalk video? Hard to say, Audrey. During his conversation with us, he drew on bits and pieces from both of his books, The Element and Out of Our Minds, as well as anecdotes from both his 2006 and 2010 TEDTalks. What was really interesting was the Q&A at the end. There were a range of questions: Why and when were you knighted? How does originality play into creativity? How do I bring my staff along in my quest to foster creativity in my school? Sir Ken was able to answer each question with humour and sensitivity, drawing on memorable stories or events, often taking the audience on quite a circuitous route before he finally made his point. It was brilliant! I spend a certain amount of time in the car and love to listen to audiobooks. 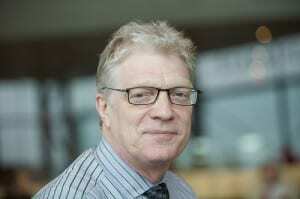 I listened to Sir Ken Robinson’s The Element which was read by him. It is wonderful to hear his words in his voice. He certainly makes a strong case for following one’s passions. There is a movement advocating passion-based education. One of its champions is Angela Meiers who will be the keynote at the K12 Online Conference. Here is one of her blog posts where she outlines what she means by passion based learning http://www.angelamaiers.com/2011/07/guidelines-of-passion-based-learning.html I know she has been influenced by Sir Ken. Much to ponder.